From the 10th to the 21st of September we held a small group exhibition at the Faculty of Philosophy, University of Sarajevo, as a part of “A Month of Japan at the Faculty of Philosophy”. The exhibition consisted of the selection of works by Taida Jašarević-Hefford, Jasmina Gavrankapetanović-Redžić, Emina Kujundžić and me. The title of the exhibition represented our professional and personal interest and involvement in Japanese arts and culture. In September the Faculty of Philosophy and the Embassy of Japan in Bosnia and Herzegovina planned series of events under the name of “A Month of Japan at the Faculty of Philosophy/ Japanese September”. At the same time at the Faculty of Philosophy, 3 students from Sophia University (Tokyo) held the Summer Japanese Language Program 2018 and together with 14 students from Toyo Eiwa University (Tokyo) and their professor Sasajima Shigeru were a part of the “Connecting Stories and Sharing Bosnian and Japanese Cultures: Intercultural Learning Workshop“, and a week later professors Kaoru Koyonagi and Taro Komatsu from Sophia University held public lectures. And so it happened that Selma Đuliman, Vice Dean for Scientific Research and International Academic Cooperation at the Faculty of Philosophy, asked my wife, Larisa Kasumagić-Kafedžić, Assistant professor at the Faculty of Philosophy, if I could make a solo exhibition like I did last year at the time of the visit of professor Taro Komatsu and his students from Sophia University. We said NO… but I could try to make a small group exhibition with my friends. And that is what I did. I invited Taida Jašarević-Hefford who studied (gained her PhD in print making) and worked in Japan for 9,5 years, Jasmina Gavrankapetanović-Redžić who earned her MA from Okinawa Prefectural University of Arts, and is currently in Kyoto on research, Emina Kujundžić whose paintings reflect her interest in anime. My wife and I were very moved by the words of our friend from Soshigaya, who, at the time when we invited her and her family for the home cooking to our place in Tokyo, said: “We lived in Europe for 7 years and we never had a chance to taste some homemade national dish, we only had to rely on restaurants.” And we made it a rule to invite all our visiting friends to our house, where I would make some national and rare dish for them. 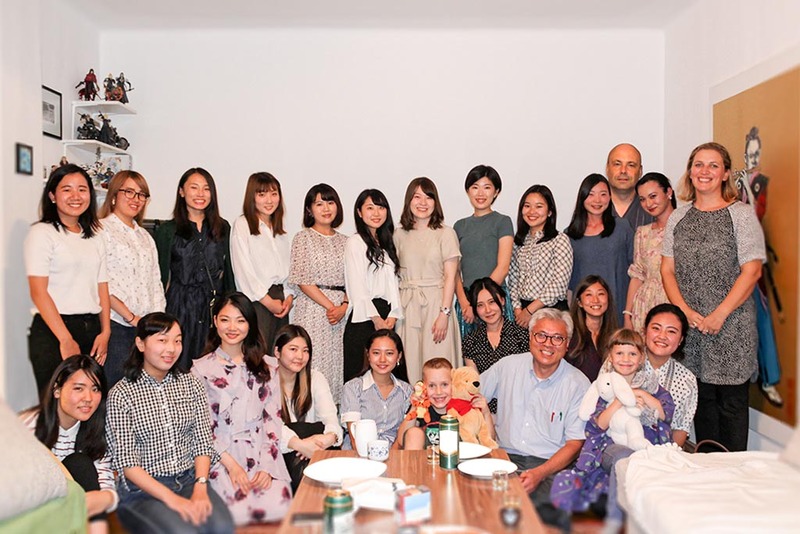 Even if there is 20 of them 🙂 So we had a small dinner at our place with 14 students from Toyo Eiwa, 3 from Sophia, professor Shigeru, our friend Nozomi Miyanoya, a teacher of Japanese language course at the Faculty of Philosophy and Haruna Sugahara, a student from Tokyo who helped me in setting up my exhibition in Tokyo and now is my neighbor in Sarajevo. I served klepe, Sarajevo´s gyoza served in yogurt and freshly chopped garlic, potato stuffed bell peppers- baked, and for mez(z)e- sujuk, a domestic beef sausage; fresh cheese from Valšić mountain, and a farmer cheese that is domestically called šnite (slices,) because it can be cut in slices, with texture closely resembling unseasoned tofu, and seasonal salads. For the dessert, tulumbe and hurmašice. While they were dining, they could observe my paintings at my home. Initially, the opening was planned for the evening hour, but since the Intercultural Workshop was starting at 10h and this exhibition was a welcoming gesture of the Faculty of Philosophy, the opening was held at 9h in the morning. The exhibition was opened by Muhamed Dželilović, Dean of the Faculty of Philosophy, who expressed his personal interest and belief in future projects between Japanese universities and the Faculty of Philosophy; Selma Đuliman, who thanked guests for being interested in Bosnian education and culture; and I introduced artists and their works at this exhibition. A notable guest at the opening was Natsuko Yumoto, Cultural Attaché of the Embassy of Japan in Bosnia and Herzegovina. I also used this opportunity to present my latest work, Ki-Oku. I would like to thank Selma Đuliman for her initial idea and support for this exhibition. My friends who joined the exhibition, especially Jasmina Gavrankapetanović-Redžić who managed everything from Kyoto. I would like to thank Iva Simčić, Vice-Dean for Teaching at the Academy of Fine Arts, University of Sarajevo, for supporting this exhibition (easels saved my life), and Ajla Šabić & Nozomi Miyanoya for providing Japanese translation for the promotional materials. And I would like to thank all the guests from Japan. You can download BHS/Japanese language brochure for this exhibition here. Students from Toyo Eiwa University: Nozomi KITAMURA, Tomona MATSUDA, Airi TAKIZAWA, Rina SASAKI, Toshimi SHIRAI, Mirei KUNITAKE, Yukino IWAMA, Rena KIDO, Mika KAWASE, Riho YOKOHIRA, Natsumi NUNOYA, Rie EBATA, Minami SAKUMA and Airi YAMANAKA with professor Sasajima SHIGERU. Students from Sophia University: Yumi ORIHARA, Yukiko IMASHIRO and Erina MATSUSHITA with the teacher of Japanese language course at the Faculty of Philosophy, Nozomi MIYANOYA and Haruna SUGAHARA, Intern at EURO CLIO HIP BiH. And my family. 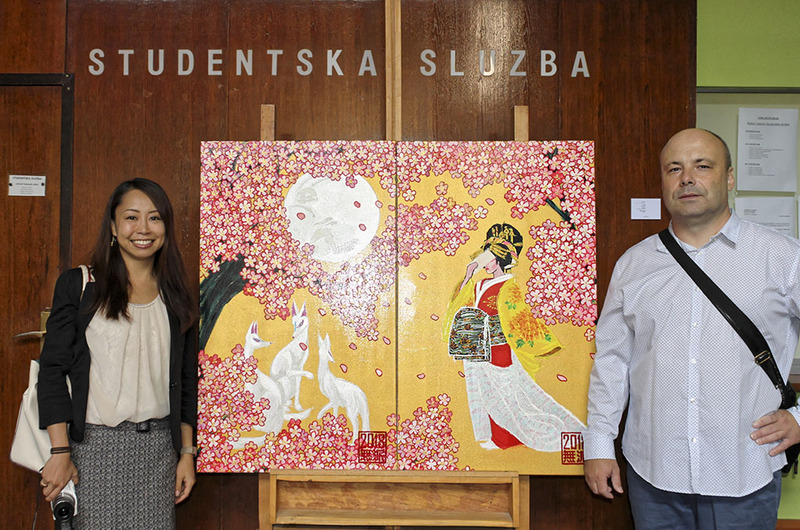 With Natsuko Yumoto, Cultural Attaché of the Embassy of Japan in Bosnia and Herzegovina and my latest painting, Ki-Oku. Taro KOMATSU, Nozomi MIYANOYA, Larisa KASUMAGIĆ-KAFEDŽIĆ and Kaoru KOYONAGI at the exhibition.